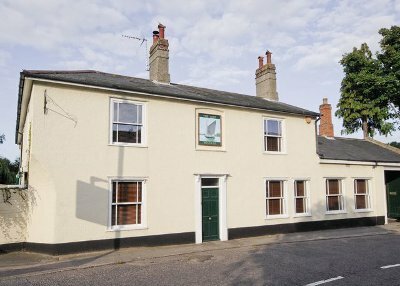 If you're looking for a large holiday cottage to spend your holiday with friends and family; and you're looking for a place in East Anglia - "The Ship" in Beccles may just be the holiday cottage you've been looking for. The Ship used to be a pub, and can be found right next to the River Waveney, on the edge of this Suffolk market town. A quality cottage, The Ship sleeps 8 people in 4 bedrooms. Bedroom 1 is a double - with an en suite wet room and toilet; bedroom 2 is also a double - with a four poster bed and en-suite bathroom with Jacuzzi bath; bedroom 3 is also a double, and has an en-suite bathroom with roll top bath, shower cubicle and toilet; bedroom 4 is a twin bedroom and has an en-suite shower room and toilet. The Ship also boasts a wood burning stove in the living room - the ideal place to gather on a winters' night. Outside you have a nice garden to sit and enjoy a summers' evening; and with that river frontage you can just sit and watch the world go by. For any fisher-folk out there, you can sit outside your cottage and try and catch a roach or two. You may want to get out and see what the area around The Ship has to offer you. Well, for starters, there is Beccles. This old market town is well worth exploring; you're only a ¼ mile from the town centre, and can visit any number of pubs, restaurants and cafes. The Swan House restaurant, in the heart of Beccles, is one such place which is worth spending an evening. Or should you be cooking a meal at The Ship, I'd highly recommend Seppings butchers - they have the best sausages out there. Should you be taking your holiday in the summer, you might want to visit Beccles Lido, and start your day with a swim. The city of Norwich is a 30 minute drive from The Ship, and offers plenty of culture, entertainment and shopping experiences - the Castle Museum, Riverside area and Chapelfields shopping centre will give you what you want; there is even a ski slope at Norwich - which may come as a shock, as this part of the world is well known for being flat! For those with children to entertain, you're certainly not short of things to do: BeWILDerwood near Horning is a tree-house festooned treat for the younger children; or try Africa Alive for those interested in wild animals; Pleasurewood Hills Theme Park for the thrill seekers; and, let's not forget, the beaches - Lowestoft and Great Yarmouth both have large sandy beaches which are ideal for a family day out - with Great Yarmouth having all the seaside entertainment you could possibly wish for. Finally, you have the Norfolk Broads on your doorstep - so you can hire a boat for a couple of hours; or, for the more adventurous, hire a kayak! (Both motor cruisers and kayak hire can be found at Waveney River Centre in Burgh St Peter). The Ship makes a lovely place to spend a few days, and in a beautiful part of the country too. Should The Ship not be to your liking, but you fancy staying in the area around Beccles, you might well be interested in the cottages below. All these cottages are within a few miles of The Ship.